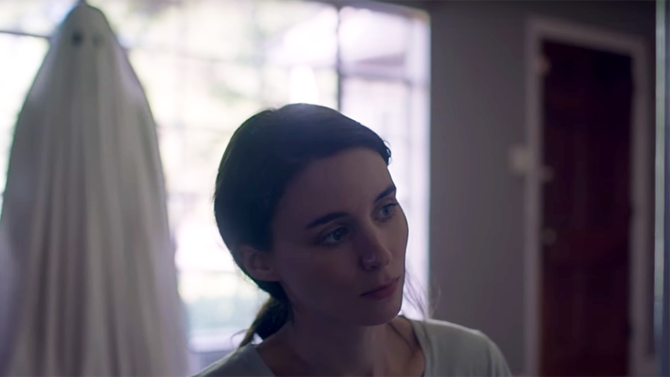 A Ghost Story stars Casey Affleck and Rooney Mara as an unnamed couple with uncomplicated lives. She wants them to move to another city. He refuses. Then he suddenly dies. She grieves, moves out and moves on. He stays put, forever haunting their once shared space. With this premise, the film slowly transforms from sad love story to an abstract meditation on the infinite nature of time – a reflection of an existential crisis that director David Lowery once experienced. Lowery’s anxiety is best articulated in a monologue by an outside character: an overalls-clad Will Oldham drunkenly philosophizes about finding meaning in an absurd universe. Oldham refers to beloved artworks, but as Affleck and Mara’s relationship demonstrates, meaning can be found anywhere – from Beethoven’s ninth symphony to a small handwritten note from a lover. A Ghost Story explores the lifelong emotions that accompany the act of finding meaning, and it does this by establishing a solemn ambience through a meticulously edited and meditative rhythm. The film’s initial pace recalls contemporary slow cinema (Lowery cites the films of Tsai Ming-Liang and Apichatpong Weerasethakul, and Chantal Akerman’s Jeanne Dielman as some of his favourites). Finding meaning, as Affleck and Mara do in recalling memories of their relationship, can be a nostalgic act, and there’s a sweet, childlike sentimentality present throughout Lowery’s work. Affleck’s phantom takes the shape of a lumpen bedsheet with two black pools for eyes, for example, an image associated with the homemade Halloween costume of childhood. Lowery’s first feature, St. Nick, basks in the playful preoccupations of its child protagonists, and his third film, Pete’s Dragon – which he describes as “a love letter to my cats” – earnestly depicts the nurturing dynamics between a kid and his large, mythical best friend. In his own youth, Lowery figured his trajectory might follow the model of American independent directors like Wes Anderson or Paul Thomas Anderson. “I would make personal idiosyncratic movies on bigger and bigger budgets. But I matured as a filmmaker more or less in an era in which it’s really hard to do that,” Lowery explains. Originally published in The National Post (July 24, 2017).